Max, a client for Best Buddies Va.
Max dreamed for months of working for his favorite sports team — the Washington Nationals. 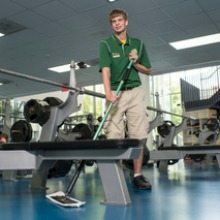 He’d been working for close to a year at George Mason University’s aquatic and fitness center at the Patriot Center after graduating from the GMU LIFE Program designed for individuals with intellectual and developmental disabilities (IDD). It was assistance from the Best Buddies Virginia career-matching program that helped him make his dream come true, according to Ryan Erickson-Kulas, program supervisor of the organization’s Job program for the Va. area. The group works to match those with IDD with employment that is competitive and community-integrated. We recently caught up with Kulas who told us about the organization’s person-centered approach to career matching and how he and his colleagues are building relationships with local business to enable them to realize the potential that comes with hiring someone with an IDD. WashingtonExec: Tell me about your current role. What do you do and how did you come to work for Best Buddies? Ryan Erickson-Kulas: I am responsible for employer recruitment, tracking and fulfilling contractual obligations, and ensuring the accuracy of the billing process. I also supervise Employment Consultants who work with our participants. Before I worked for Best Buddies I taught high school math for two years as a part of Teach For America. Each semester I taught a special education inclusion class, which had 30-50% of students with some sort of disability. Teaching those children and working side by side with special education teachers got me passionate about the disability rights movement. I began working as a Program Manager in our Friendship program here at Best Buddies after my TFA commitment was complete and then transitioned to the Jobs program. WashingtonExec: How does career matching for Best Buddies work? Have you noticed any trends in the types of positions/industries your clients choose? Ryan Erickson-Kulas: Best Buddies focuses on what is called person centered planning when it comes to find jobs for our participants. We focus on the person’s specific skills and desires. We believe that if we find a job for a participant that they are excited about and interested in it will lead to a better outcome for them and their employer. Another huge priority is to identify candidates that are an excellent fit for a business’ needs and culture. We will determine if there’s an outstanding fit in our internal talent pool. If there is not an immediate fit, we will source for the specific position to find the right candidate. We will work with businesses to determine the time-sensitivity of the company’s needs in order to fill the staffing need within the required timeline. We can also carve out a position at a company if one doesn’t already exist. This would consist of taking tasks from multiple current employees and combining them into a new position. This would allow the current employees to be freed up to work on tasks more suited to their expertise. Because of our person centered approach work we work with a wide variety for employers. We have participants working in law firms, corporate headquarters for international companies such as Audi and Rosetta Stone, family restaurants, and sporting arenas, among other places. WashingtonExec: What happens once a client is hired within a business? WashingtonExec: What was most rewarding about working to match Max with a job with the Nats? Did you encounter any roadblocks? Ryan Erickson-Kulas: In April Max he told me he was interested in working for the Nationals. Together we worked to see what openings they had available at the time and applied. On my end I followed up with a contact with the Nationals that we used for a fundraiser to get an introduction to HR and explain the supports that the Best Buddies Jobs program provides. Max was brought in for an interview and offered a position as a Guest Experience Representative on the spot! The one challenge we had was training Max as to how to get from his residence in Fairfax to Nationals Park. Max had rarely done that trip by himself. However, after a few weeks of travel training he is now making the journey by himself with no trouble. It was rewarding to help someone secure a job with his favorite baseball team. Max typically mans the left field gate helping customers enter the park. It is so wonderful to see how his co-workers have embraced him as part of their family. WashingtonExec: How has the type of work you do for Best Buddies changed, if at all, in the past 2 years? Ryan Erickson-Kulas: It is tough finding a job in this economy regardless of whether one has a disability or not. Our program has seen that over the past two year. However, we remain committed to the idea that everyone regardless of ability can make a meaningful contribution to society through competitive and integrated employment. WashingtonExec: What exciting projects is Best Buddies Va. currently working on? Ryan Erickson-Kulas: A big event for us is the Audi Best Buddies Challenge: Washington, D.C. This is a cycling event and is our main fundraiser of the year. This year The Challenge will be on October 18th. You can choose to ride 100, 62, or 20 miles. Each route takes riders along a scenic tour of our nation’s capital. All rides are fully supported, with rest stops along the way and support vehicles on the road. Cannondale rental bikes are also available. There is also The Carl Lewis Challenge 5k, which is a five-kilometer run or walk led by Olympic legend Carl Lewis centered around the Washington Monument. All proceeds will be going to Best Buddies. We already have companies where our participants work signing up as a corporate team. WashingtonExec: What’s next for you in your work? What’s next for Max? Ryan Erickson-Kulas: For me the biggest thing is building relationships with business so that they realize the huge potential that hiring someone with a intellectual or developmental disability. I want to position Best Buddies Virginia as a go-to staffing source for companies in and around the D.C. area. For our participants, our program isn’t just about finding a job. It is about building a career. They are always looking to see what ways they can grow professionally just like anyone. I know Max has expressed interest in working in an office setting some day. We just want to be here to make sure that Max’s goals, and the goals of all our participants can be achieved.